Power supplies current are rated on output voltage. PSU with 2A means on 5V. No one care how much it draws on 110V - it will be of course very small current. Sorgelig wrote: You've measured wrong! Dang it, you're right. I fixed my previous post. The correct current is 1.1A @ 5V = 5.5W. "Ref attached screenshot, the pointed out place have plated slot, but no soldermask opening there on top side. Should we add soldermask opening there ? " I am not sure what my response should be. it's on purpose, to prevent USB connector touch the 5V line. Option with 5V connector is soldered on the bottom where solder mask is present. Now my (your) boards are on the way!!! LED 15 - when the USB hub is powered but not connected this indicates that the FE2.1 IC has survived the install and is operating OK? The USB cable should be wired like this? Can I test the USB hubs by wiring on a USB type A standard cable and plugging into a PC? gojira54 wrote: LED 15 - when the USB hub is powered but not connected this indicates that the FE2.1 IC has survived the install and is operating OK? gojira54 wrote: The USB cable should be wired like this? cannot check D+/D-, but in general it's correct. gojira54 wrote: Can I test the USB hubs by wiring on a USB type A standard cable and plugging into a PC? yes. it's generic USB hub. 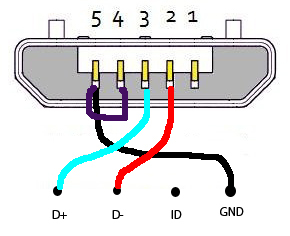 I've build the USB hub and have a question. When should be the amber LED on ? It's never lighting. How can I check if the LED is working with the MiSTer ? LED were checked with multimeter and they are OK. It's unclear when amber LEDs should lit. I think it's ok not to solder amber LEDs. It appears that the amber LEDs should only light when there is an error condition or an over-current issue. It's clear this LED will lit in case of error, but it's unclear what kind of error it can show except the over-current. Over-current is impossible as there is no VBUS controlling chip used and 5V of USB is connected directly to 5V of power supply. I will update, once i isolate the source of the issue. You are the first who report it. I've soldered several hub boards - all are ok. And as i see some people selling it assembled. Probably something wrong in your assembling or some component (XTAL?) is out of spec. Now using 5 gamepads + 1 keyboard. Totally 6 ports out of 7 are used. 7th port is also used but as a power source for TOSLINK decoder. So, it's pretty much good achievement for picky USB host on DE10-nano. It wasn't so straight - i had to find correct ports for every gamepad to make them recognized on boot. Ok, found my issue.. I had different solder bridges at a microscopic level (i didn't notice them on the first 3 inspections at 10x) causing issues. Once they were removed all the hub boards were good to go!! Even with a stencil it would put way too much solder paste on and I had to wick shorts away so I brought some of the amtec sticky flux and a finer tip to drag solder the pins and this is a lot better. Once the chip is in place with no shorts under my cheapo usb microscope the rest is easy enough and I only had a few issues with green leds not working and just needed another pass with flux and the fine soldering tip. I solder the wire to power jack under the board. This is most compact and easier way to supply 5V to USB hub. Of course it's not for generic user. Don't draw 5V from micro USB connector - you will get a lot of problems with USB as the USB power is provided by tiny weak chip tending to rise over-current flag. So, getting 5V from micro USB is really bad idea. leejsmith wrote: Even with a stencil it would put way too much solder paste on and I had to wick shorts away so I brought some of the amtec sticky flux and a finer tip to drag solder the pins and this is a lot better. Once the chip is in place with no shorts under my cheapo usb microscope the rest is easy enough and I only had a few issues with green leds not working and just needed another pass with flux and the fine soldering tip. If you use soldering iron then i don't suggest to use the soldering paste. Use solder wire. I use it myself and solder all boards for MiSTer. USB hub chip in TSOP case is a little tricky as it requires match on both X and Y axis. Paste can be worse as it may go deep under and provoke the bridges if heat/flux is not enough. I used my hot air station with the solder paste and then my iron to clean up after. The AMTECH NC-559-V2-TF flux has saved this work for me. I have used it to clean up the work and now I have 8 working boards. I will clean them in my ultra sonic bath before sale. What about using the power socket on the usb board as the main power source and then soldering a barrel lead on the usb board to pass power to the de10. this way the end user will not need to solder anything. leejsmith wrote: What about using the power socket on the usb board as the main power source and then soldering a barrel lead on the usb board to pass power to the de10. this way the end user will not need to solder anything. I've just wrote how i connect it myself. Of course for generic user there are 2 alternative places to install power socket and use split cable to connect the 5V to DE10-nano and USB hub. I have ordered some parts so will give my idea a go. Am i correct in thinking the brass supports on the bottom of the de10 are not long enough for the power socket on the usb hub ? Right. You need longer standoffs with power socket. This is how I am thinking of doing the usb hub board. I moved the brass stand off from the de10 and used them on the usb hub with some feet. The usb is on a header and the power is soldered to the jack and then passes it through to the de10. This is then plug in with no solder required. It's better to solder the power socket on other alternative place. So both power sockets will be on the same side. Sorgelig wrote: It's better to solder the power socket on other alternative place. So both power sockets will be on the same side. I can see that now I have it all connected.